VÖ / Release-date: 29th of November 2013 #### The 29th of November is the date that has been set for the release of ?Futile? 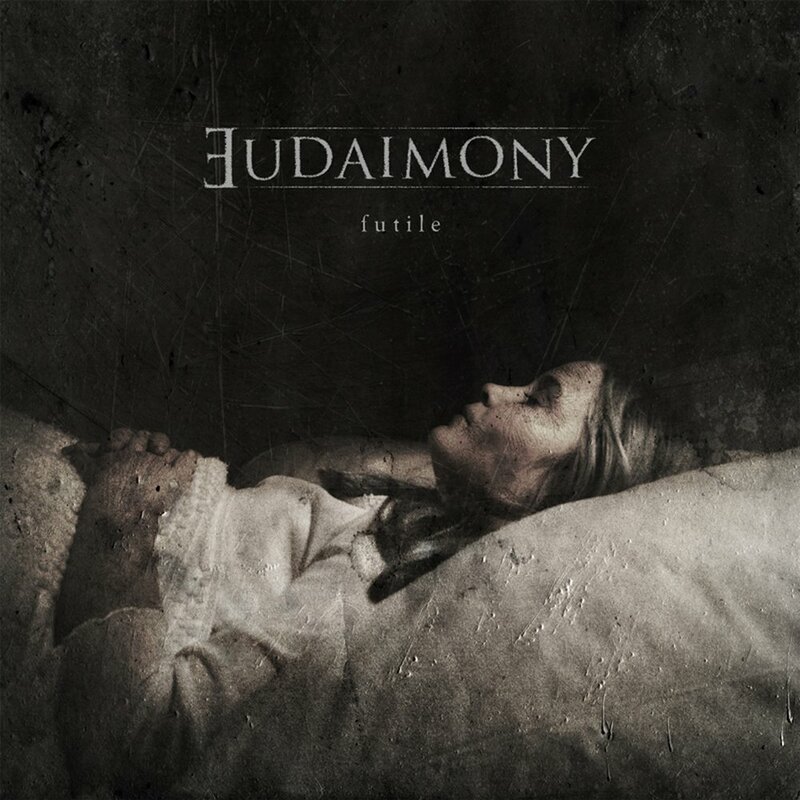 the debut full-length album from EUDAIMONY, the band formed by former DARK FORTRESS frontman Matthias Jell and NAGLFAR?s Marcus E. Norman (BEWITCHED, HAVAYOTH, ANCIENT WISDOM). The eight-track album, which will be released on Germany?s Cold Dimensions label, includes guest appearances by Mick Moss of ANTIMATTER and Schwadorf of EMPYRIUM and THE VISION BLEAK. The vocal recordings, mixing and mastering of ?Futile? were carried out by Markus Stock at the Klangschmeide Studio E and the album artwork is by Ben Borucki (Irrleuchten) from the German band SONIC REIGN. With a lineup that includes Jell on vocals and Norman on guitars, bass, synthesizer and programming, Jörg Heemann (SECRETS OF THE MOON) on drums and Peter Honsalek (NACHTREICH) on viola, the natural assumption would be that EUDAIMONY?s music fits somewhere within the Black Metal/DSBM genres. But that is too simplistic an assumption to make where EUDAIMONY is concerned, because this is a band that explores the hopelessness and futility of life, both lyrically and visually, as exemplified in Jell?s lyrics and the sense of mystery in Borucki?s artwork, whilst the music itself forms an atmospheric soundscape of rich melodies that range from the fragile and haunting to the powerfully dark and brooding. #### Other musicians opinion on ?Futile? : #### "Good crossover between German and Scandinavian styles of Black Metal with a doomy, tragical touch. A must for fans of early Dark Fortress, early Katatonia and Manes. Grim and gloomy but with a nice production." #### Herr Morbid (FORGOTTEN TOMB) #### "A piece of polished darkness. Atmospheric, dark, beautiful and still grim. Well played, brilliantly composed, a really good production and excellent vocals." Patrick Hellström (BLOODLINE) #### "I really like the atmosphere of this album!" Fredrik Norrman (OCTOBER TIDE) #### "I just love, how the 1990s atmospherics blend with a little more modern approach on this album. It features some really skillfully executed touching moments without ever sounding cheesy. Fantastic album!" Ulf T. Schwadorf (EMPYRIUM, THE VISION BLEAK).